If one looks closely at such a crisp border, the features of the moon’s topography are visible, as is the case in this image from Oct. 7, 2010. This recently inspired two NASA visualizers to overlay a 3-dimensional model of the moon based on data from NASA’s Lunar Reconnaissance Orbiter, or LRO, into the shadow of the SDO image. Such a task is fairly tricky, as the visualizers — Scott Wiessinger who typically works with the SDO imagery and Ernie Wright who works with the LRO imagery -- had to precisely match up data from the correct time and viewpoint for the two separate instruments. 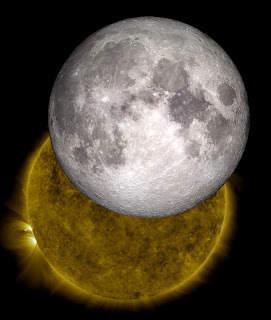 The end result is an awe-inspiring image of the sun and the moon. To start the process, the visualizers took the viewing position and time from the SDO image. This information was dropped into an LRO model that can produce the exact view of the moon from anywhere, at any time, by incorporating 6 billion individual measurements of the moon’s surface height from LRO’s Lunar Orbiter Laser Altimeter instrument. The model had to take many factors into consideration, including not only SDO’s distance and viewing angle, but also the moon’s rotation and constant motion. Wright used animation software to wrap the elevation and appearance map around a sphere to simulate the moon. The two images were put together and the overlay was exact. The mountains and valleys on the horizon of the LRO picture fit right into the shadows seen by SDO. In its own way, this served as a kind of calibration of data. 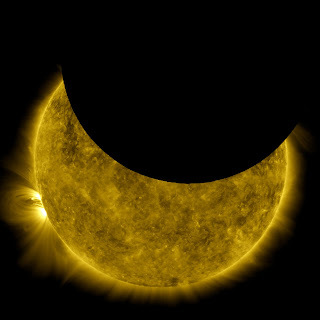 It means that the SDO data on its position and time is highly accurate and that the LRO models, too, are able to accurately provide images of what’s happening at any given moment in time. And of course, the whole exercise provides for a beautiful picture.